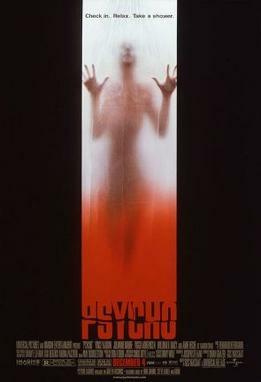 In 1998, Gus Van Sant set out to film a remake of Hitchcock’s classsic, Psycho. Van Sant used a shooting script from the original movie which included notes from Hitchcock himself. I saw this remake when it hit video for the first time. Being a huge fan of the original, of course, I was set to not like it from the beginning. Honestly, at the time, I didn’t hate it, it just felt superfluous. Like why even bother? So I filed it away and really never thought of it again. So now that I’ve decided to have this Psycho week, I decided to rewatch this remake (as well as the original). I still feel the same. Even more so after watching this right after the original. Why bother, Van Sant? It’s so close to the original there is literally NO NEED to watch this movie. Sure, Julianne Moore tries to bring a little different to the Crane sister character and Vince Vaughn definitely plays Bates a little different, but not enough to warrant watching this. Anne Heche does NOTHING different with Marion Crane which makes her performance even less. You not only get nothing new out of this you are also watching an almost literal copy of the dialogue and scenes from the 1960 original. SO WHY NOT JUST WATCH THE ORIGINAL? Like I said, I don’t hate this remake. It just makes me sad. It has to be one of the most useless movies ever made. When Van Sant was asked why he did it, he just said that he did it so no one else would have to. NO ONE ELSE WOULD HAVE THOUGHT OF DOING IT, DUDE. He must have been high off his big 1997 hit Good Will Hunting and thought he was invincible. Apparently not. This entry was posted on October 5, 2012 at 9:00 am and is filed under Alfred Hitchock, movies, Norman Bates, pop culture, Psycho, reviews with tags Alfred Hitchcock, AWESOME-tober-fest, AWESOME-tober-fest 2012, Halloween, holiday, movies, Norman Bates, Psycho, reviews. You can follow any responses to this entry through the RSS 2.0 feed. You can skip to the end and leave a response. Pinging is currently not allowed. I’ve never seen this. Love the original and never really felt the desire to check out a shot for shot remake. But I must say I really love the trailer. I think it is really clever, especially the ‘mind of Norman Bates’ bit. I still have no strong desire to see it though. Agreed…why mess with a good thing? The only thing that really strikes me about the trailer is how YOUNG Vince Vaughn looks. You’re right, this remake was not needed, but I liked Vince Vaughn in it. The original is excellent.